Defending champion Naomi Osaka joined world number two Simona Halep in exiting the Indian Wells Open on Tuesday. Osaka was blitzed by 23rd seed Belinda Bencic in straight sets as her title defence came to a surprise end in the fourth round. 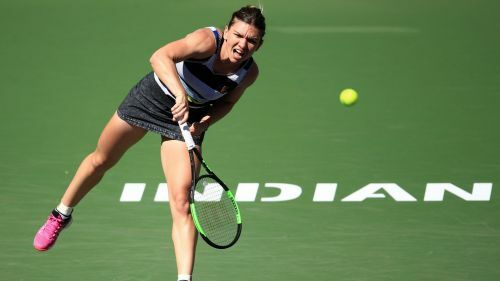 Earlier in the day, Romanian star Halep lost to unseeded teenager Marketa Vondrousova following a three-set battle in California. Angelique Kerber, meanwhile, survived to earn a quarter-final showdown with Venus Williams. It was a day to forget for Halep, who fell victim to Vondrousova 6-2 3-6 6-2. Halep responded after losing the opening set, dropping just three service points to level the match in fine fashion. However, the former world number one – who double-faulted to hand a break back early in the third – fell behind 5-1 and it was a bridge too far as Vondrousova claimed her first top-10 win. Next up for Vondrousova – who ensured two teenagers reached the Indian Wells quarters for the first time since 2009 following Bianca Andreescu's upset of Wang Qiang, which set up a match against Garbine Muguruza – is Elina Svitolina. Ukrainian sixth seed Svitolina needed three hours, 11 minutes to overcome Ashleigh Barty 7-6 (10-8) 5-7 6-4 in the longest WTA match of the year. Only 65 minutes went by as Osaka was on the receiving end of a comprehensive 6-3 6-1 defeat to Bencic. Bencic was quick off the mark, racing out to a 5-1 lead in the opening set, while she enjoyed similar success in the second to maintain her good form.
.@BelindaBencic knocks out World No. 1 Osaka, 6-3, 6-1! The Swiss has not lost since January, while Osaka will remain number one after the tournament following Halep's elimination. "Honestly, I think at a time like this with that scoreline, I would usually feel very depressed and sad," Osaka said. "But I feel pretty good right now, because I think, given the circumstances, I tried my best and I don't really have any regrets. I tried to be positive throughout the entire match." Czech fifth seed Karolina Pliskova stands in the way of Bencic and the semi-finals following her 7-6 (7-0) 4-6 6-2 win over Anett Kontaveit. For the second year in a row, three-time grand slam champion Kerber will feature in the quarters following her hard-fought 6-1 4-6 6-4 victory against Aryna Sabalenka. Having split the first two sets, ninth seed Sabalenka went up a double break in the third as Kerber faced defeat.
.@AngeliqueKerber comes back from 4-1 down in the third to defeat Sabalenka! But Kerber – the eighth seed – rallied to secure a meeting with 2018 semi-finalist Williams, who defeated Mona Barthel 6-4 6-4. "I was pretty determined this year," Williams said. "I haven't played that much, so I wanted to make it count. It's not going to get any easier from here, so I just have to continue to raise my game."